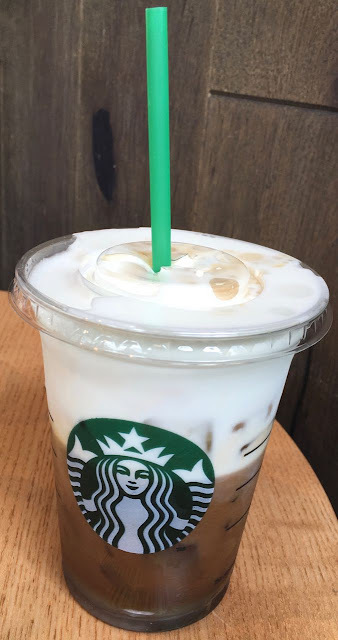 On a warm day, which was muggy rather than sunny, I decided to stop off at Starbucks and pick up something like an iced latte. I’m not a fan of the frappuccino style drinks, I don’t think we have the weather for them in the UK. They never seem to melt in time, and if rushed cause an ice cream headache. My summer drink of choice had always been a latte over ice, which is far more fitting for the average warmth of a British summer. As I was standing in the queue at Starbucks I noticed their new drink being advertised, the Cappuccino Freddo, and after checking it wasn’t ice blended I decided to give it a try. This looked like a complicated drink to make. It started with espresso’s being poured over ice to cool them. There was a couple of pumps of syrup, but there was also the fun of chilling skimmed steamed milk to pour on top. I took the drink back to the table and gave it a sip. I had a sweetness overload, and really didn’t like the first sip at all. It was so very unpalatably sweet. I realise this was the syrup and that it wasn’t mixed in, I’m not sure if this was intentional, I wasn’t given anything to stir it with, but I couldn’t see why you’d leave it like that either. Thankfully after a few sips the sweetness hit wore off and I got a lovely rich dark flavour of the strong coffee from the espresso. This was much nicer, and it had a slight bitter edge which I much preferred. The more I drank of this the more creamy the drink became as the milk element blended in and the whole thing came together. I think this would be by drink of choice in Starbucks for the summer, but I will certainly be asking them to skip the syrupy stuff, I don’t like sugar in coffee so this had absolutely no positive impact on my drink at all. Was I supposed to have stirred it in anyway? Who knows, but the dark espresso to the milky finish was a lovely way to drink the rest.